Kerala PSC has held the Village Field Assistant Exam for some districts today. The Exam for Village Field Assistant in Revenue Department is being held in three phases in the month of November 2018. On November 4, Candidates who opted for Alappuzha, Kottayam, Thrissur, wayanad and Kannur districts wrote the exam. The Solved Question Paper of Village Field Assistant Exam held on November 4, 2017 is given below. Click Here to Download the Village Field Assistant Exam Solved Question Paper - November 4. 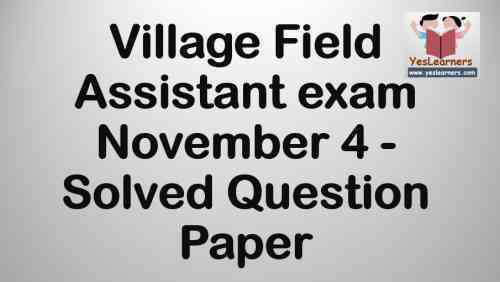 Click Here to Download the Village Field Assistant Exam UnSolved Question Paper - November 4. Click Here to download Common Answer Key of Village Field Assistant - November 4 Exam. The Solved Question Paper with Answers is in PDF format.